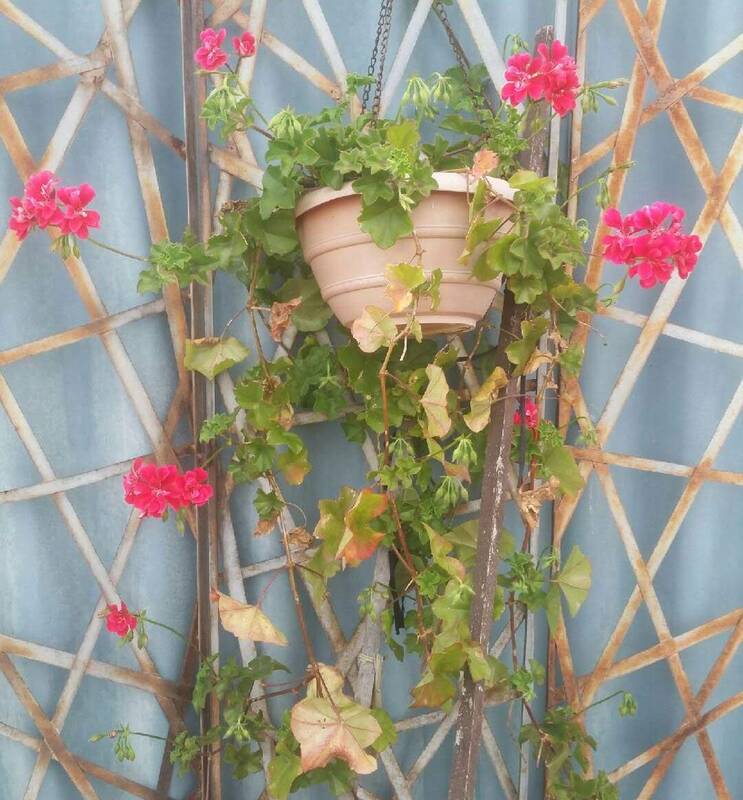 A friend sent me the above photo of one of her pelargoniums (commonly known as geraniums) a while ago, asking me to identify what was wrong with it and what she should do. 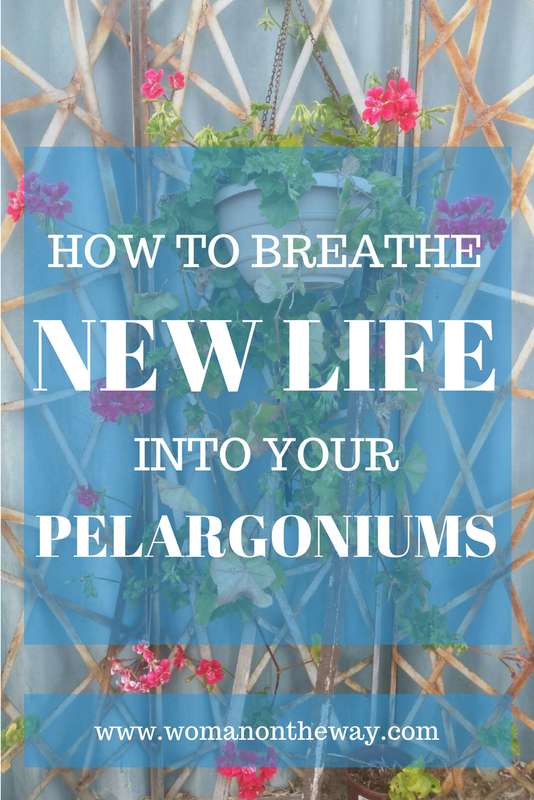 After giving her some advice, I asked for and she gave me permission to use her photo in this blog post for a case study of how to breathe new life into a sad looking pelargonium. It's something all us pelargonium lovers need to know, because sometimes we can neglect our plants for a bit too long and they end up looking like the above picture - just a little bit sad. 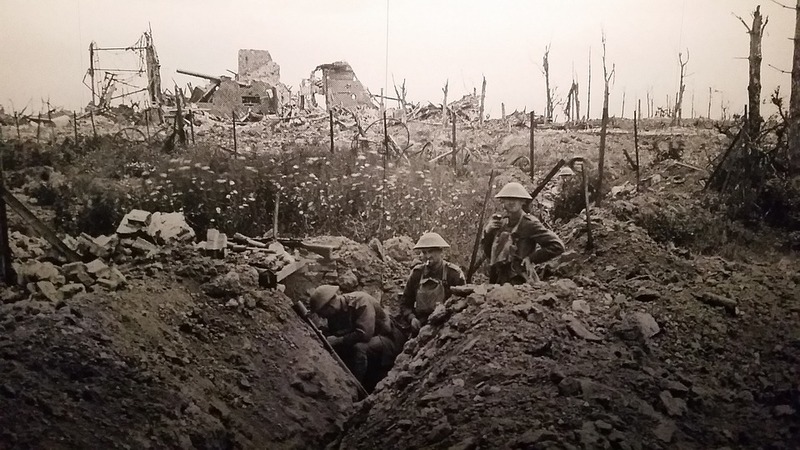 It's not that they're dying or even really sick - they just don't look as good as they used to. And that makes us feel a little bit sad too. So what do you do with your pellie when it looks like this? 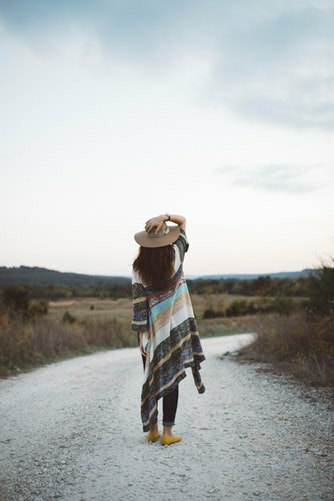 How do you give it that new lease on life? The first thing to do is pinpoint what's wrong with it - why doesn't it look its best? Let's use the above picture as an example. That's all really. This pellie has plenty of flowers and buds on it so that isn't an issue, and there doesn't seem to be any signs of caterpillars or other pests (such as holes in the leaves). It is mainly the leaf colour and lack of bushiness that makes it look washed out instead of vibrant like it should. The next thing to do is work out what is causing the aesthetic issues. Why are there so many yellow and dead leaves? Leaves have a life cycle like anything else - eventually they die. It could just be that there are a lot of old leaves on the plant and I would say that that is the case with this particular one. The location of the yellow/dead leaves tells me this - they are towards the base of the stem. In contrast, the new leaves at the tip are green. It could also be due to under-watering though - when pelargoniums don't get enough water, they will use what they do have to support the new growth rather than keep the old growth. That leads to the premature death of old leaves. 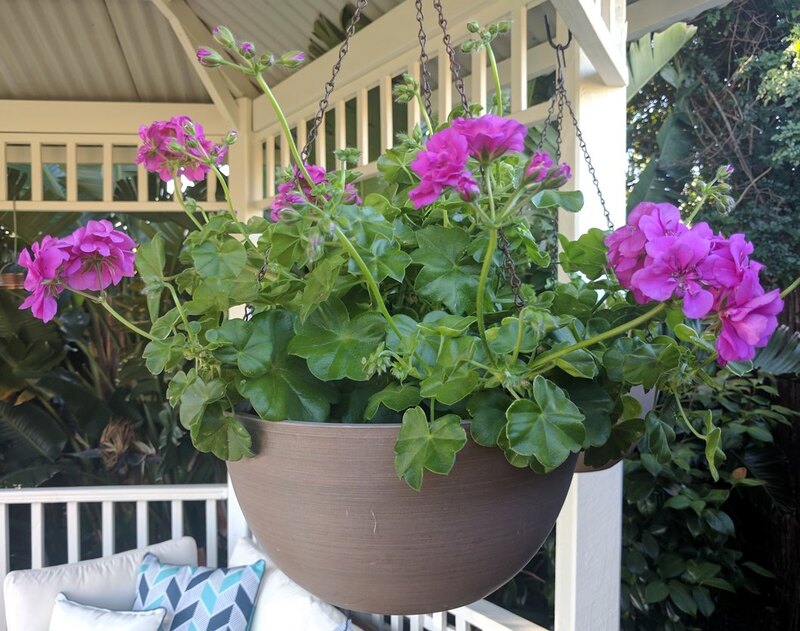 I have written another post that deals extensively with watering pelargoniums and the signs of over and under-watering so you may want to have a look at that if you'd like to know more. A third reason is too much sun/heat. Ivy pelargoniums like this one don't like temperatures over 30°C in the full sun very much, and if they are exposed to it for too long, they are likely to lose leaves. I don't think that this is the case for our example plant however, simply because this photo was taken at the end of winter. But it is something to bear in mind when assessing your own plants. Why are the branches so straggly? Most ivy pelargoniums do not have a bushy habit; by which I mean, they are inclined to grow a few very long branches rather than lots of shorter, bushy branches. It is their nature to either climb or hang down, so if you don't want them to do this, intervention is required i.e. pruning. Pruning induces a plant to branch more which gives the bushy look that is generally most desirable in these plants. So the answer to the above question is simple: the stems are straggly because they need pruning. Why are the leaves small and light green? You may think to yourself:"The leaves on this pelargonium used to be bigger and a much darker green - I wonder why they aren't like that anymore?" Again, the answer to this question is simple: poor nourishment. What happens to humans when they aren't fed enough? Well, they start to look skinny and pale (among other things). Plants are the same. If there isn't enough nourishment in their soil, they will produce smaller leaves that are not so rich in colour. You have finished your assessment of your pelargonium and now have some idea of what might be causing its lack-lustre appearance. Now what to do about it? Remove the yellow and dead leaves. Do not hesitate to pull off leaves that look ugly, for whatever reason. You will be amazed at what a difference it makes just to get rid of them and do nothing else at all! I try to do this with my pellies on a regular basis so that there isn't a build-up. Along these lines, it is good to dead-head regularly too (this just means remove the spent flowers on the plant). The general rule is to remove anything dead or ugly. If you think an excess of yellow/dead leaves may have been caused by under-watering or too much sun, of course it is sensible to also address these issues once you've tidied up the plant (otherwise you will be picking off leaves until they are all gone!). Prune the stragglers. The next thing to do is to give this plant a good prune. 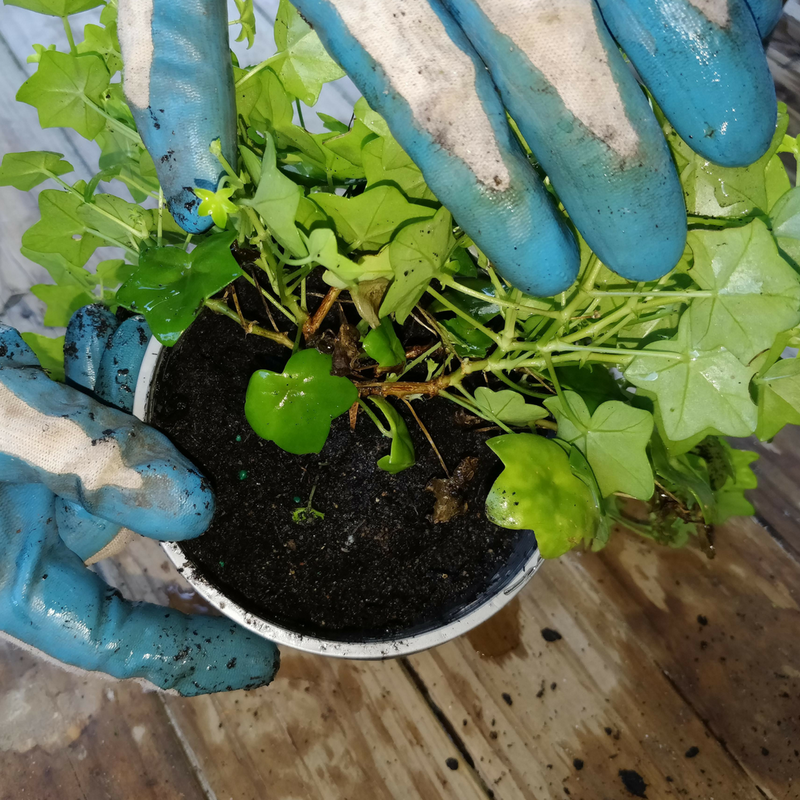 Most ivy pelargoniums are able to take a pretty hard prune so in this case I would probably cut it back to just below the rim of the pot it's in (see picture below). This will get rid of all the stragglers and promote lots of bushy new growth from the stems that are left. You can use the same method for other types of pelargoniums too (zonals, regals, scented leafs and staphs/stellars) - if they are looking very leggy, just prune back to about a third of the size and they will re-sprout nice and bushy in no time at all. Visually divide the plant into thirds. Cut back the first third of the plant to a third of its size. STOP! Wait for new growth to appear on the part of the plant you have just pruned. 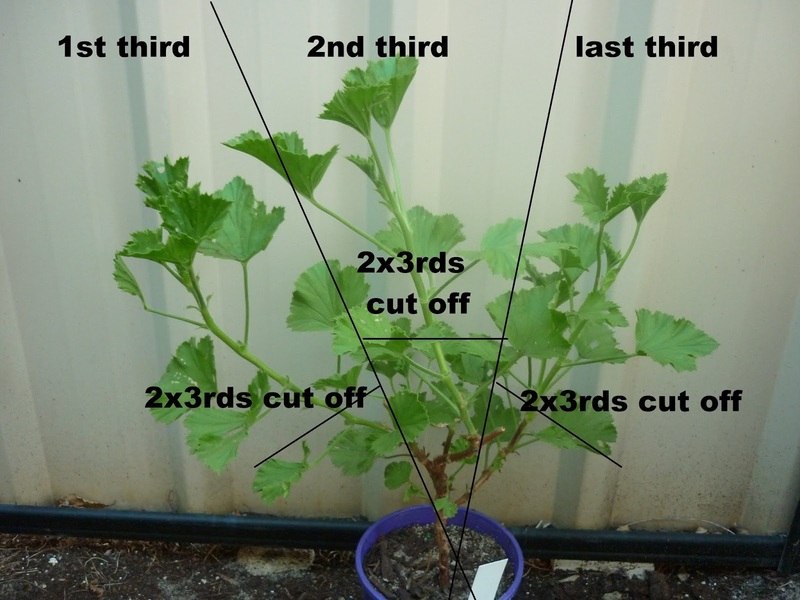 Cut back the second third of the plant to a third of its size. STOP! Wait for new growth to appear on the second third. Below is a diagram that illustrates this process. Re-pot. I suspect that my friend's ivy pelargonium has gotten a bit too large for the pot it is in and would appreciate some more space for its roots in the way of a bigger pot. Re-potting it will also give it some fresh soil to grow into and therefore extra nourishment. The general rule of thumb when re-potting is to go only to the next size up pot - this reduces the risk of the plant sitting in wet soil for too long and rotting. Having said that, it's also a rule I ignore on a fairly regular basis! I don't like having to re-pot too often, so once one of my pellies gets to a decent size (say it has filled a 150mm pot), I tend to plant it into its final position (either a large pot or the ground). If you decide to do this too, just be extra careful not to water it too much. If you are not confident that you won't accidentally over-water your plant, it is best to re-pot into only a slightly bigger pot size (say 20-50mm bigger for a smaller plant and 50-100mm bigger for a larger plant). My friend's ivy pelargonium looks like it's in about a 250mm hanging basket, so I would re-pot it into between a 300-350mm basket. It should be able to stay in this size permanently, provided it is fertilised on a regular basis. Water the soil first and allow it to drain (a moist root ball will come away from its pot more easily than a dry one). Tip the pot upside down while supporting the top of the root ball with your other hand, then gently tap on the bottom of the pot and/or use a downward throwing motion to help the root ball come loose. Gently remove the pot and tip the plant right side up again. Gently tease out the roots on the sides and bottom of the plant. 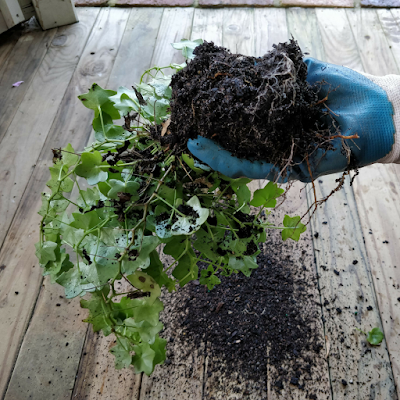 If it is very root bound, you can even trim off the bottom inch or two of the root ball and make some vertical cuts up its sides (to about a third of the way up). The goal is to loosen and spread out the roots. Roots that are too tightly packed tend to strangle themselves and do not take up nutrients well, so by doing this you are enabling them to grow into the new soil much more easily. 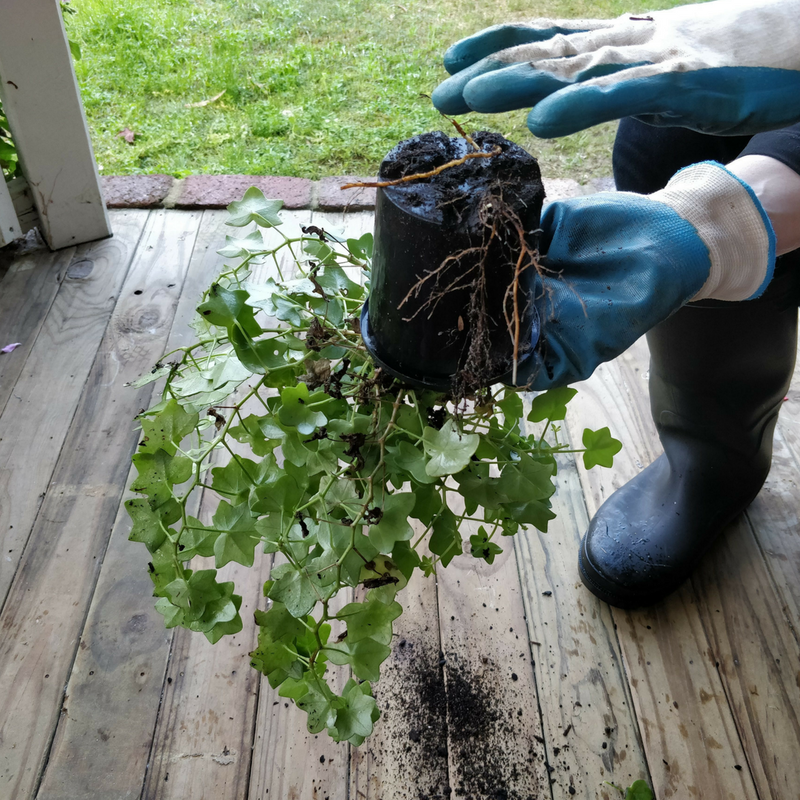 Place the plant into its new pot, putting enough soil underneath it so that the top of the root ball sits about an inch below the rim of the pot (this leaves space for watering). Fill in the gaps between the root ball and the sides of the pot with fresh soil. Water the plant in well, adding more soil to fill in any spaces that appear after the air gaps are eliminated with the water. Fertilise. 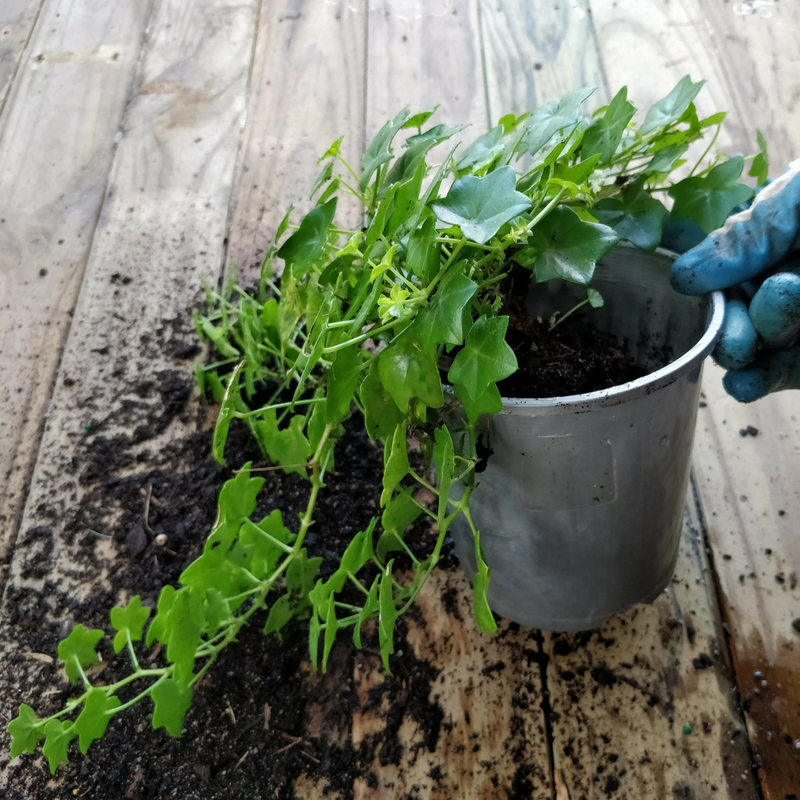 This step is optional if you have just re-potted your plant into some good quality potting mix, which has fertiliser in it. However, I still like to add a little bit of my favourite fertiliser, blood and bone, to ensure that my pelargonium has plenty of food. 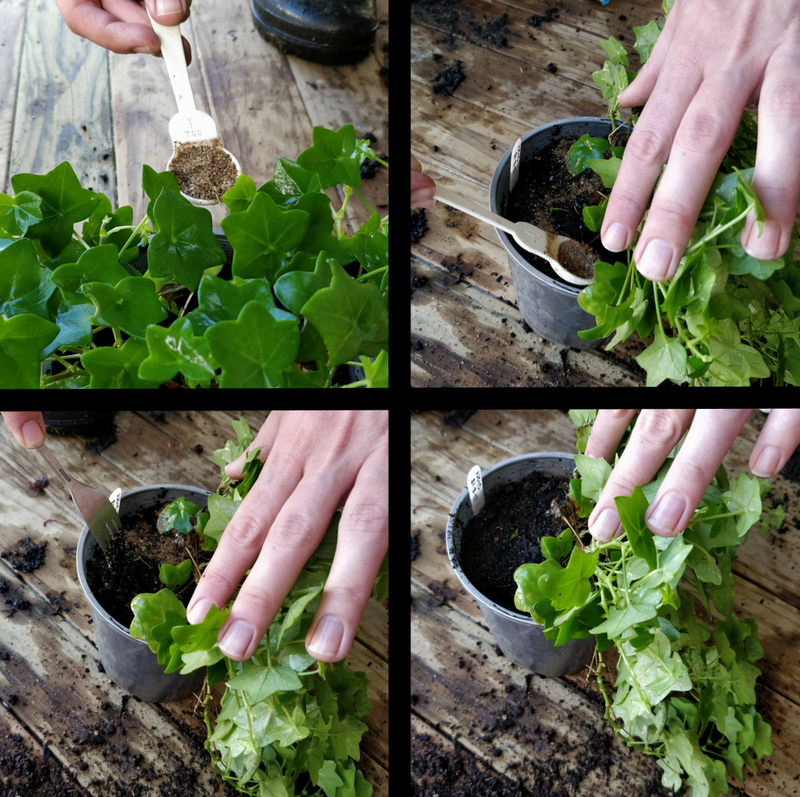 I sprinkle a little around the base of the plant, scratch it in with a fork and then water well (there should be no visible blood and bone left on top of the soil). There are many other fertilisers to choose from that you can also use at this stage - just apply at the recommended rates (found on the back of the package). Your sad looking geranium will be looking better in no time and you will be amazed at the difference your efforts make - lush green, bushy foliage and in time, plenty more flowers (to make up for the ones you have pruned off). It is always best to try to prevent your plant getting to a lack-lustre state again, and this can be done through regular removal of dead leaves and flowers, tip pruning, fertilising and an appropriate watering schedule. Healthy plants not only look better, but resist attacks of pests and diseases much more effectively too. I am in awe of your expertise and your capacity to explain things so clearly. Be warned, I'm going to need a garden guru soon and I think you might just be it!! The heat never helps, I am always relieved when autumn rolls around!